The infamous crispy rice with spicy tuna. Before traveling to Los Angeles, I hit up Twitter for recommendations of what to see, do, and eat. I received a variety of responses, including several mentions of the crispy rice with spicy tuna. 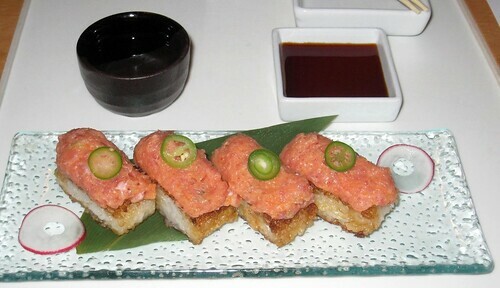 In particular, Abby Tegnelia (aka The Jungle Princess) was emphatic that this sushi dish was best enjoyed at Katsuya. With a 6:20 pm arrival at LAX, I was in the perfect position to make the trendy sushi restaurant my first stop in town. Stefanie (aka Adventure Girl) and I rolled up to the Brentwood location around 8 pm. While we waited a moment for the hostess to seat us, a Bentley pulled up to the valet. I couldn't help but notice there was already one Bentley parked at the curb. Clearly, we weren't in Virginia anymore. We were seated at a counter that wrapped around a cooking station in the middle of the restaurant. Normally, I wouldn't hesitate to take a photo of the interior, at least on the way out, however the place was packed and I was suddenly feeling image conscious. I could barely take photos of the food knowing the two women nearest to us smirked at one point. Luckily, Stef wasn't one to be embarrassed by my foodie flash photography. We ordered a bottle of hot sake and crispy rice and spicy tuna, of course. The rice had been packed together, and then fried until golden brown on the exterior. The cool minced tuna sat atop the warm crispy rice, topped with a slice of jalapeno. I'd never had sushi quite like it, though one sumptuous bite was enough for me to understand why it'd become so popular in southern California. Next, Stef ordered the creamy rock shrimp. There's nothing not to like about shrimp doused in seasoned cream. Our third dish was the rainbow roll, which included pieces of tuna, salmon, shrimp and some kind of white fish. Again, it was delicious. Beyond being beautifully presented, it simply tasted a cut above similar rolls I've had before. 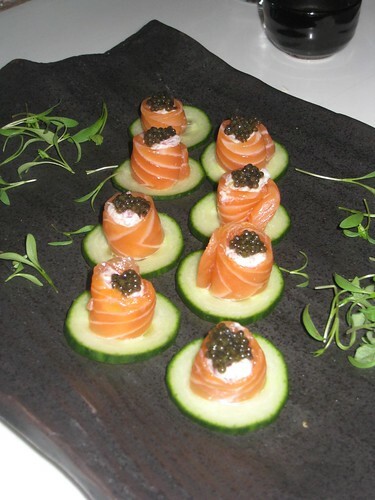 Salmon sashimi with caviar, served on a cucumber crisp. We continued to order each plate one by one, which allowed for ample time to catch up since our adventures in Rwanda the month before. Already having gone over the sushi deep end, I went a step further and ordered the salmon sashimi with caviar. It was a challenge to pick up the cucumber slices along with the salmon, so it became a two-part process for each piece. And once you've gobbled up the good part, the cucumber slice seemed unnecessary. But they did make for a nice presentation. Hot chocolate cake with vanilla ice cream. When it comes to the final course at Asian restaurants, I don't expect much, so it was a surprise to hear the waiter mention hot chocolate cake. Of all the dishes, this is the one I'm glad we shared the most. 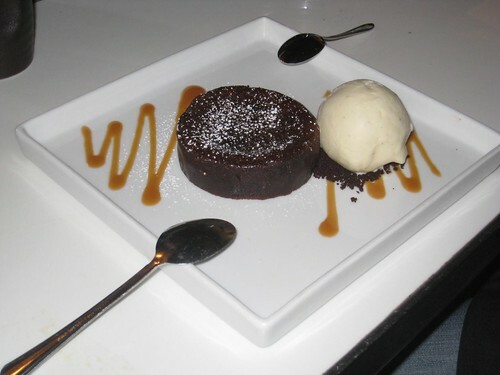 The molten center makes this dessert a chocolate lover's dream. You've been warned. 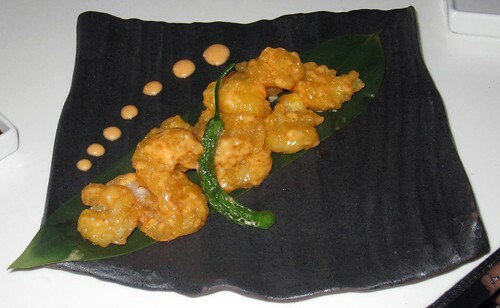 Katsuya has locations in Brentwood, Glendale, Hollywood, and downtown Los Angeles. To save a few bucks, check out their happy hour specials. That looks so delicious, if only I knew how to make sushi… I realize how many varieties of sushi I haven't tried yet. Did the two of you eat all that alone? Yes, we shared every dish. And by the time dessert was gone, I was stuffed. I like to cook, but sushi is one cuisine I’m happy to leave to the pro’s. The Alfred Hitchcock Locations Walks in London and New York-Sandra Shevey takes visitors to New York on a suspenseful excursion through Manhattan and Queens in the footsteps of director Alfred Hitchcock who immortalised some of New York City`s most romantic neighborhoods in 9 of his New York-based films.The walk which goes every Monday, Wednesday and Saturday throughout the year, lasts for 3 hours and departs at llam. The cost is $25 excl Metrocard.The voyage takes us to such locales as midtown Manhattan, Greenwich Village, Jackson Heights, Forest Hills and Astoria.Films profiled include `North by Northwest`, `The Wrong Man`, `Strangers on a Train`, `Topaz`, `Rear Window` and `Spellbound`.Seeing the actual sites of Hitchcock`s locations enables us to understand the distortions- ie the ways that his imagination transformed sites. The result allows us to penetrate the magic of this masterful genius.Sandra Shevey has been profiling film since l968 and interviewed the director Alfred Hitchcock in l972. She has authored numerous articles and several books both and has also taught cinema at several universities in America. She became a permanent British resident in the eighties and as a member of the older unemployed devised the Alfred Hitchcock London Locations Walk. I very thankful to find this site on bing, just what I was searching for :D as well saved to bookmarks.